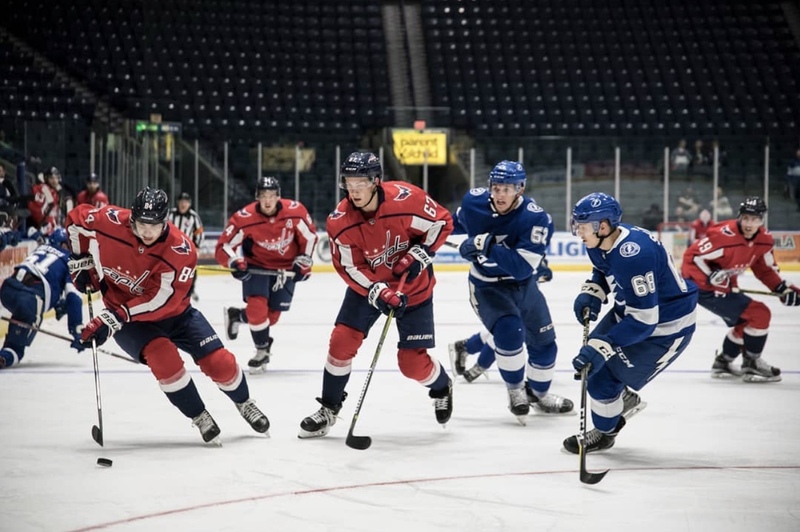 The Washington Capitals’ prospects took to the ice Monday morning against the Tampa Bay Lightning prospects and won the game with a statement 5-0 score. It’s worth noting that the Lightening played the day before and the Capitals had the day off on Sunday, but these are young men so fatigue probably wasn’t too much of a problem. The Capitals were also without Lucas Johansen and Connor Hobbs, two of their top three defensemen. A period by period break down can be found here, in this post, we will take a detailed look at the players. Off the bat, Martin Fehervary was a stand-out for the entire game. He plays a lot like former Capitals’ fan favorite, Nate Schmidt. Where they resemble each other the most is in their skating; Martin is an incredibly smooth skater that can get up and down the ice in a heartbeat. He makes that first good pass in the defensive zone to get it out before joining the rush, or will take the puck himself to get it out of danger and into the offensive zone. The Lightening announcers even mentioned Fehervary as he picked the puck off an opposing player’s stick in the slot “in a blink of an eye”. He had a great assist on the Capitals second goal of the game while on the power play. Many (including me) really frowned on using a second round pick on Martin, but he’s proving that he could be a great hockey asset going forward. Although it was just one game, it was encouraging to see Jonas Siegenthaler adapting his game. When he first came over to North America, one of his knocks was that even with his large frame he wasn’t using it properly. But throughout the game he was pinning guys to the boards or tying up players in front of the net. He can already skate very well, if he can use that speed mixed with his size, he can become a real threat in the defensive zone. Probably the most impressive offensive player for the Capitals was Shane Gersich, which shouldn’t be too surprising, as he was maybe the best prospect in last years camp. He’s fast, physical, smart, and has a heck of a shot; it’s best to reference him as “mini-Oshie”. He was being centered by Garrett Pilon in the prospect game and they were a lot of fun to watch. They both are quick, skilled, and love to shoot. They will both be rookies in Hershey this season, but it’s probably best to play them on separate lines as they are both high volume shooters. A very underrated pickup by the Capitals recently was the signing of German player Maximilian Kammerer. He was all over the ice, especially in the offensive zone. He saw the ice very well and distributed great passes. But don’t sleep on him defensively. Towards the end of the second period, the Lightning had a 2-on-0 down low. A pass went across the slot to an opponet for a great open net chance, but Max dove back and broke it up. That’s the kind of play coaches love to see. Alexander Alexeyev has three assists through the first two games of the tournament and has looked very good. But like most rookies trying to adjust from juniors to the next level, he made his share of turnovers. They were decisions that would probably work in the WHL, but not with tougher competition. He’d try to deke or make a fancy pass that just wouldn’t work. Fellow WHL player Eric Florchuk also had this problem. But these kids are young and are expected to make mistakes. Alex Kannok-Leipert is the youngest player on the Capitals, who just turned 18 in July. He didn’t play in the first game, so he was rusty out of the gate for game two. In the first period he made mistakes and turnovers, but as the game progressed, he got better and better. He’s a physical kid that has some offensive pop to his game. It was a good showing for the youngster. Maybe the most intriguing player on the Capitals is Finnish winger Juuso Ikonen, who signed with the Capitals last spring. This tournament is his first real taste of competitive North American hockey. Ikonen was incredibly fast and a beast on the forecheck. If he somehow didn’t beat an opponent to the puck he would use his tenacity to free the puck up, find a teammate and get it to them. He made a great play in the neutral zone: he got to a loose puck and took a heavy hit right after making an amazing no look backhand pass to Kody Clark who went in on a breakaway for a goal. Ikonen is a playmaker, but also has a great shot (evident in his nasty snipe in the shootout after the game) that he needs to utilize way more. He had two great chances for a shot and elected to pass. Hopefully goal scoring is an aspect he’s willing to build upon while in the AH, or at least pair him with a shooter like Pilon or Gersich. The Capitals prize gem stone, Ilya Samsonov, had a tough outing in game one against the Nashville Predators, but came out a lot more poised against the Lightning. He was barely tested in the first period, but when Tampa came out flying in the second and third period he stood his ground on his way to a 21 save shutout. He had his fair share of toughies but only once really had to go out of his way to prove his worth. Early in the third period, once again, the Lightning had a 2-on-0 down low, and when the pass came through the slot Samsonov was able to push over and rob the opponent from a wide open net. Samsonov is key to the Capitals organization success for years to come so it will be exciting to see how he develops in the AHL this upcoming season; maybe even see him in the NHL. No one on the Capitals team really stood out and that’s a good thing because they looked so good that everyone was noticeable. The Capitals have scored nine goals through two games and there have been eight different goal scorers. The team isn’t relying on one player or even one line to succeed. In the first game all four lines scored and the in the second game the first three lines scored. It hasn’t been about a few players, which a lot of these prospect tournaments rely upon, but the team as a whole. Everyone was buying into what coach Spencer Carbery was preaching in this short time. Everyone was joining the rush (sometimes even defensive defensemen were spotted under the opponent’s goal line), everyone was back checking, blocking shots and passes, and clogging up the neutral zone. Even the Lightning announcers made note of the Capitals fast, heavy forecheck and their ability to blocks shots in the defensive zone. If these limited game showing what will be coming to the Bears then it looks very promising. This entry was posted in News and tagged 2018 Prospect Tournament, 2018 Rookie Showcase, Alexander Alexeyev, Ilya Samsonov, Jonas Siegenthaler, Luke Adomanis, Martin Fehervary, Maximilian Kammerer, Shane Gersich, Tampa Bay Lightning. Bookmark the permalink.